Rahm Emanuel’s “public-private partnership” with Elon Musk looks a lot like the parking meter privatization that still haunts Chicago. That’s no accident: such partnerships are massive giveaways to corporations. After renegotiating with the private investors that run Chicago’s parking meter system, Mayor Rahm Emanuel just couldn’t keep his mouth shut about the “public-private partnership.” During the 2015 mayoral race, he slammed opponents for voting against the new deal. “I made lemonade out of a lemon,” he boasted about the renegotiation — though whether it actually helped city residents is questionable. But these days Emanuel is quiet about what may have been the shadiest and most one-sided privatization deal in US history. His office didn’t make a peep about a recent annual audit—now a spring pastime of sorts in Chicago—which revealed that the meters raked in $134.2 million in 2017, all of which went to the likes of Wall Street firm Morgan Stanley and Abu Dhabi’s state-owned investment arm. Why the silence from City Hall? Well, it’s not exactly good news that the investors are an estimated three years from recouping the entire $1.16 billion they paid for the meters. That means every cent of revenue beyond operating costs from there on out will be pure return on investment — for the next sixty-three years. 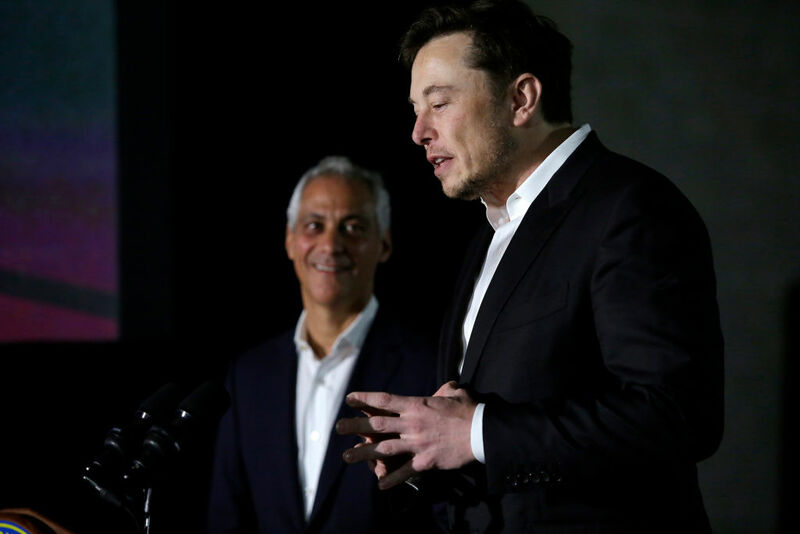 But there’s also the fact that Emanuel just handed out a similar deal, a public-private partnership with Tesla CEO Elon Musk to build an underground express train from downtown to O’Hare International Airport. Triggering memories of what Chicagoist called a “herpes outbreak: it reminds you it’s still there at the most inopportune times,” might derail the fledgling project. Yet we need to know more about these types of deals, and not just in Chicago. Decades of tax cuts in the name of austerity have shrunk infrastructure spending at all levels of American government. As roads, transit, schools, and water systems crumble nationwide, a burgeoning industry of private equity investors, construction giants, and global water companies are shopping “public-private partnerships,” i.e., private financing, as a silver bullet. So much so that Democratic mayors in cities like Washington, D.C., and Denver, Colorado have opened offices to take unsolicited proposals, even as the Trump administration pushes public-private partnerships as the key to rebuilding the country. Ribbon cuttings and photo-ops are priceless for politicians looking to win votes and consolidate power. And the Elon Musks and Morgan Stanleys of the world are backing up the truck to help whoever is willing. Here’s what we know about public-private partnerships. First, whether leasing out existing infrastructure or building it new, they’re expensive. Governments traditionally borrow cheap money using tax-exempt municipal bonds, which have low interest rates. Private financing has a much higher interest rate because the investors that loan it demand a healthy return on investment. So, despite the common refrain that private financing is “free money,” the public ends up paying more in the long run. In the 2008 parking meters deal, then-Mayor Richard M. Daley essentially took out a loan and increased a de facto tax — parking rates — to pay it back. Rates more than doubled by 2013, and the investors are estimated to make at least $11.6 billion in total, ten times what they paid to the city. Chicago’s deputy mayor says about the proposed express train that “the city won’t be on the hook for any of it.” Yet because it will be paid for through fares, and Musk will demand a healthy profit, the train will be an expensive, boutique option for only those that can afford the $25 fare. If revenue projections come up short, the city will almost certainly be on the hook. Public-private partnerships also tend to be secretive and undemocratic. Daley publicly announced the parking meter deal before the City Council had a chance to read, let alone vote, on the contract. Emanuel is routing the train deal through a shadowy city agency called the Chicago Infrastructure Trust, run by hedge-fund managers and real estate developers with a few alderman and labor leaders sprinkled in for good measure. When entire projects are bundled together under the control of investors, and contracts including arcane financing arrangements stretch over hundreds of pages, the public — particularly poor and working-class residents — get even less of a say than usual. Like any privatization scheme, public-private partnerships also limit public decision-making. Morgan Stanley and the other investors have billed Chicago millions of dollars to make up for taking meters out of use for things like road construction and street festivals. The deal effectively makes it much more expensive to make long-term changes, like adding bike and bus lanes — for the next sixty-five years. With all their guts laid out on the table, these “partnerships” are revealed for what they really are. Like “interest rate swaps,” “auction rate securities,” and “social impact bonds,” they are yet another Wall Street swindle — a flashy, convenient way for elected officials to sidestep criticism for not standing against the corporations, investors, and real estate developers that hold sway over our cities. They’re a faux antidote to the manufactured crisis of austerity, offered up by the same folks that keep the crisis alive. And they’re helping turn our cities into playgrounds for the wealthy by pushing out poor and working people. They’re not partnerships, they’re highway robbery.